During the American Revolution, Virginia troops built Fort Nelson, an earthen fortification on the Portsmouth side of the Elizabeth River. More specifically, Fort Nelson was situated on the Windmill Point plantation of Robert Tucker III, now the site of the Portsmouth Naval Hospital. In 1779, the arrival of British naval and land forces in Norfolk harbor drove the Virginia garrison from Fort Nelson (Higgins and Downing 1991:20-21). After seizing the town of Portsmouth, the British demolished Fort Nelson. The British infantry commander, Major General Edward Mathew, reported that "the Engineer has been employed for many Days, with near one Hundred Blacks, to destroy the Fort, which was so substantially constructed, as to give us a great Deal of Trouble in the Demolition" (quoted in Clary 1990:8). In 1787, Robert Tucker III died leaving the Windmill Point property to be sold and the proceeds divided among his heirs. However, the land was later partitioned instead. Thomas Newton, Sr., of Norfolk, one of Tucker's sons-in-law, acted as one of the executors of the estate. In 1793, his son, Thomas Newton, Jr., was sent by Governor Lee to inspect Virginia's coastal regions and to recommend potential sites for fortifications. The younger Newton stated that "the most proper places on our river for defense are Old Point Comfort & Point Nelson [i.e., Windmill Point]- the place where the old Fort stood, nearly opposite us & half a mile out of Portsmouth" (Arthur 1930:36-37). 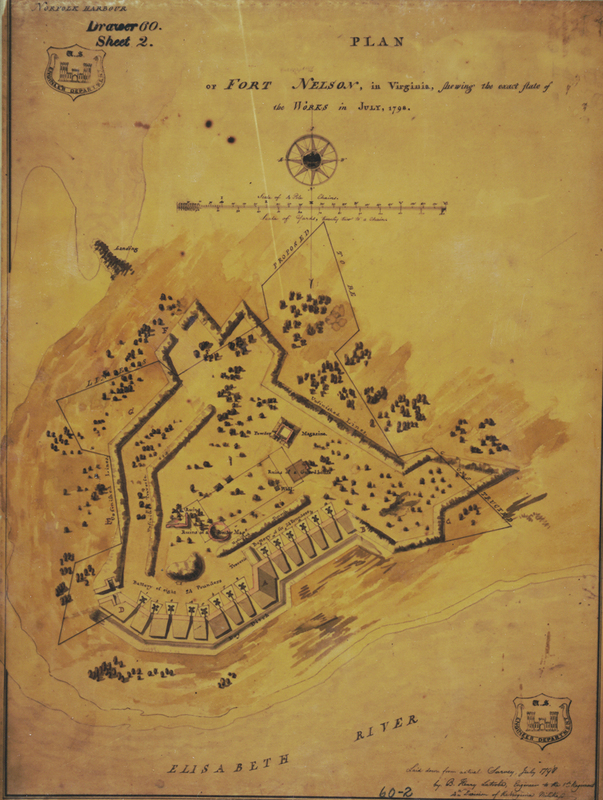 On March 14, 1794, as preparations for the fortification of Norfolk harbor were underway, Thomas Newton, Sr., obtained title to a 64-acre parcel of the Tucker estate that included the site of the Revolutionary-period fort (Norfolk County Records Deed Book 35:68). The Newtons were one of Norfolk's oldest and wealthiest families. During the Revolution, Thomas Newton, Sr., had served as one of the commissioners of the Virginia Navy. Later, he held the federal post of collector for the port of Norfolk until his death in 1807. Thomas Newton, Jr., was a lawyer who helped organize construction crews at Fort Norfolk in 1794 and reported to Governor Henry Lee on their progress. He later commanded the Norfolk Borough militia. In 1800, he was elected to the U.S. House of Representatives, where he served for three decades (CVSP VII:175; Forrest 1853:54-55; Peterson 1970:15, 62, 72; Selby 1988:317). It seems almost certain that the Newtons played a major role in the decision to locate a "new" Fort Nelson at Windmill Point. As historian David A. Clary noted, "Rivardi arrived in Norfolk with the understanding that Fort Nelson would be the main work" (Clary 1990:20). Once the Windmill Point site near Portsmouth was chosen for Fort Nelson, the future site of Fort Norfolk presented a natural complement. Fort Norfolk was built on the end of a peninsula formed by Tarrants and Paradise creeks that jutted into the Elizabeth River from the Norfolk side. The opposing promontories on which the two forts were built narrowed the channel and would allow shore artillery to block passage into Norfolk's inner harbor. If the enemy succeeded in breaching the entrance to the inner harbor, the forts could sweep the width of the Elizabeth River.